Why did hippies dress that way? Learn about hippie peace signs, peasant tops, gypsy skirts, Indian influences and why hippies dropped out of society during the 60's. I was an original "flower child" back in the day. Because I was fairly young during the Summer of Love and all that, I grew up with hippie style, so I know it well. Back in the day, hippies did not call themselves hippies. In Seattle, hippies were originally called “fringies,” as in “the fringe of society”. Some people used the word "heads." Friends were categorized as either "straights" or "heads," and the name lives on in phrases such as "Dead Head" (a Grateful Dead fan). Anyway, the "hippie" movement forced women like me to invent our own boho chic fashions, as we started looking for inexpensive, creative clothing. ...is just plain wrong. Some did. Some didn’t. It wasn’t a club, like Girl Scouts, with a uniform. It also wasn’t a joke. The hippie movement was a rebellion against laws that forced people to blindly follow orders that made no sense. The voting age was 21 and 18-year-old boys were not old enough to vote but they were old enough to be forced into the jungles of Viet Nam. So, hippies were rebelling against the tyranny of the "establishment" (the people in power... mostly the government). 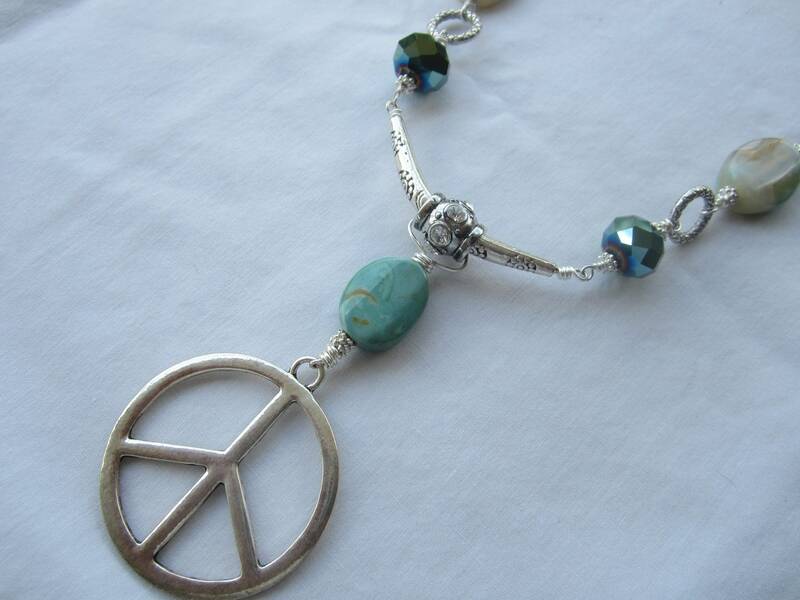 Why did many of us wear peace symbols with our hippie clothes? The peace sign showed that we were protesting the draft. It didn’t mean that hippies were peaceful wussies just sitting around in a marijuana haze all day. Young people knew that Viet Nam was not a threat to the US and they were against dying in a war that made no sense. In the 60s, any 18-26-year-old boy who wasn’t in college, was forced (drafted) to join the military and risk his life by fighting in a war seemed insane at the time. If America had been attacked, like on 9-11, things would have been different and our guys would have fought to defend their families and their country. But, the Viet Nam War seemed to be a giant hoax. Today, "neo hippies" who wear peace symbols and other hippie accoutrements should know why hippies wore them back in the day. Peace symbols were just as much about rebellion against government control as they were about getting out of the Viet Nam War. When young men rebelled against laws that they thought were unjust, they were forced to abandon conventional society. And, during the years of the draft, any guy who got a "regular" job, could be located by the government and sent off to war or off to jail, so draft-aged guys and their friends or girlfriends formed their own underground (hidden) culture. And, people without tons of bread were forced to use creativity to solve problems concerning food, clothing, and shelter. So, hippies created new ways of doing things... and cool, cheap fashion was one of the lasting results of bohemian experimentation. I'm a neo hippie born inn 1972 in the UK...I love the hippie culture of the 60's..I think you are right we are just as much rebels today..the govenment here I crap!..welfare benefits are very low for those of us who are sick and unable to work..therefore we are forced to make do & find ways of saving money..I look at the hippies of the 60's as pioneers for this generation!! !..respect to all of you! I'm glad you're carrying on the ideals of the original hippies. We are all in this together and we should all help one another. You are dead right, I think that hippies are often labeled wrong and are an important asset to society. Their alternative opinions and ability to talk up for society, protest and fight for their rights is something that often gets thrown back at them through the media and peoples opinions. It was great to see the occupy campaign a few years ago and really made a difference as to the way the governments worldwide were handling the world debt problem and also made the average joe stop and think about what was going on. But once again violence between government forces (police) broke out in many places which is unacceptable. We absolutely called ourselves freaks (and we called ourselves heads - for some reason... just like with "deadheads" for Grateful Dead afficonados). We never called ourselves hippies back in the day, although when I look back I suppose I was a hippie... even though I never would have admitted it. If anyone knows where the term heads originated or why we called each other heads, I would love to know. My guess is that it's a nickname that originated in SF. I'd just like to add that it was also the beginning of the environmental movement, and recycling clothing was just as important as stopping the war. The enormous growth of 'second-hand' shops and thrift stores grew from that, and I started buying used clothing, much to the dismay and horror of my mother's insistence that used clothes were disgusting, and meant that you were poor. She is a child of the Depression, and never had new things. Odd how political situations affect fashion. I once read an article that the happier times were, the scantier the clothing, (Roaring 20s), and during times of financial stress, the longer the skirts and heavier the clothing, to prove that the rich could afford it. I've been thinking of that off and on for years. OMG, I should have included the environmental aspect and the recycling part. It's great that you included that. I think one of my writers talked about the recycling of clothes in another article. It's so true. And, I did love the look of horror on my mother's face when I wore something from Goodwill. OMG, those were the days. You are putting a smile on my face, Jane! Glad to oblige! I have such fond memories.Thanks for reminding me this week. It's been fun wandering around your world here. Thanks for such great content! I'm pretty smiley, too. Hi there, this page really helped me with a lot of my questions. My grandparents were drifters during the time and they've really did a good job on passing the culture down to me.I'm 15 years young and I'm turning 16 soon.i just wanted to thank you because I've went to the mall with some friends the other day( which is rare because I love to thrift) and I saw manikins on display with "hippie fashion". It wasn't pleasant either. For some reason, I got offended and angry. And I wasnt even alive in the 60s or 70s! I checked the price of the thin shirt and it was 40 bucks! Boy did I get mad. But the thing that got me was when I remembered that people dressed like how they did because it WAS inexpensive. So why was the whole outfit on display summed up to 150 bucks? It didn't make sense. And thanks for the facts about the peace sign. I don't flash it out all the time but it really was great to spend my time gaining new knowledge about it.